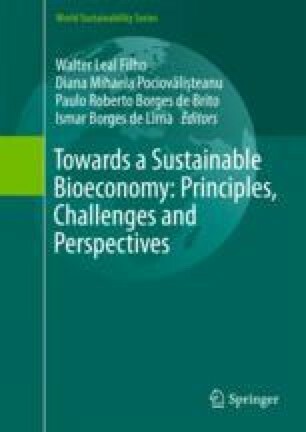 A distinctive feature of the Bioeconomy is the production and consumption of products from raw materials derived from natural biological processes, such as, for example, the growth of woody biomass used in the production of a wider range of products. The effects of intensive forestry and the intensive production of wood allow the use of renewable sources and efficient bioprocesses to stimulate sustainable production. On the basis of long-term observations on the permanent sample sites in the boreal zone obtained data on forest care regimen. The results allow us to give recommendations to intensify the cultivation of timber in natural and planted stands. Applications thinning together with fertilizers when caring for natural spaces allow getting to the age of 85 years, high-quality wood in large quantities than forestry plantations without care. In pure composition of pine and spruce stands after that increases the proportion of large-scale commercial timber. The timely regulating the composition of spaces produces a denser wood from pine and spruce plantations to a ripe age. It is now possible to analyze the results of growing plantations of pine and spruce intensive technology. It should be noted that the data on the modes of cultivation allow for consumers of woody biomass to reduce the time it was received. To create plantations for obtaining wood pulp can make recommendations based on the already acquired data. It should be noted that the density of pine and fir in the intensive cultivation to 40 years in the boreal zone to be at the level of the average of the region. Productivity indicators in 40-year-old plantation timber plantations exceed supply natural stands of the same age. The content of cellulose in the balance of raw materials derived from pine plantations exceeds that of wood older ages.